Seven decades after its adoption, the Universal Declaration of Human Rights remains a beacon of hope for the world, sending out an unequivocal message that an injustice anywhere is a threat to justice everywhere, and that no abuse of human rights can be allowed to continue without challenge. While illiberalism and authoritarianism are on the rise, it is important to recall that the UDHR -- and the covenants and conventions it has inspired -- champion every person’s right to life, liberty and security. Incorporated into many countries’ constitutions, it stipulates that no one should be subjected to torture or to arbitrary arrest or detention. It enshrines the rights to a fair trial, privacy, free expression and association, and freedom of thought in religion and conscience. Moreover, it emphasizes important social and economic rights, such as the right to work and form labor unions. But the authors of the UDHR -- created amid the Cold War politics of the 1940s -- could only agree on what rights people should have, not on why these rights should be regarded as fundamental, let alone how or by whom they should be protected. At the outset, there were no enforcement treaties, no proper appeal mechanisms, and, until much later, not even basic covenants countries could sign. A creature of its time, the UDHR also says little about the rights of women, the disabled, the LGBTQ+ community and children. And so, despite major advances over the last seven decades -- such as the creation of the International Criminal Court and the UN’s Responsibility to Protect doctrine -- human-rights abuses continue to be perpetrated at an alarming rate and with virtual impunity. To make recommendations relevant to a review of the UDHR at 70, New York University convened the Global Citizenship Commission (of which I was chair) under the auspices of John Sexton and Paul Boghossian. Our deliberations were informed by a team of philosophers brilliantly led by Jeremy Waldron. Beyond enumerating rights, the Commission argued for a new clarity about who should carry out the corresponding duties, and how. Time and again, vetoes or threats of vetoes by the permanent members of the UN Security Council have blocked action. The resulting paralysis has not only permitted massive loss of human life; it has also undermined the credibility of collective security, enabling increasingly flagrant human-rights abuses. To address this, the Commission’s report recommends that the Security Council’s permanent members voluntarily suspend their vetoes in situations involving mass atrocities and, by implication, allow more scope for the ICC. And, beyond identifying the more detailed responsibilities of governments and international institutions, new mechanisms should be created to ensure corporate compliance with human rights. It is to the credit of the UDHR’s authors that, unlike the European Convention on Human Rights, a single declaration enshrines not only civil and political rights, but also social and economic rights. But it is not enough to declare that such rights are important. In South Africa, for example, a modern constitution includes explicit commitments to upholding social rights. Yet the country has found no satisfactory means of enforcing them. One of the Commission’s most urgent sets of recommendations relates to the treatment of children now at risk in the world’s 40-plus ongoing wars. A new report that emerged this year from the Commission’s work, Protecting Children in Armed Conflict, edited by Shaheed Fatima QC, also calls for radical changes -- for schools in conflict zones to enjoy the same effective protection as hospitals; for states to take active measures to prevent sexual violence against children and to prevent child abductions and trafficking, and for a clear declaration that denial of humanitarian access is always unlawful where civilians are at risk of starvation. In the longer term, Fatima recommends that the international community consider adopting a comprehensive legal instrument and civil accountability mechanism for the protection of children in armed conflict. Former US First Lady Eleanor Roosevelt -- the driving force behind the UDHR -- once declared that human rights begin “in small places close to home, so close and so small that they cannot be seen on any maps of the world. Unless these rights have meaning there, they have little meaning anywhere.” And indeed, The Ordinary Virtues by the former Canadian politician Michael Ignatieff, which grew from a Carnegie study, indicates that even in the world’s most desolate and lawless corners, individuals have a strong sense of their own rights and also, if to a lesser extent, of the importance of treating those close to them with decency. Yet, even as the world becomes more deeply integrated, millions do not have a strong sense that human rights should be upheld as the universal rights of all. That is why the Commission, citing the work of Fonna Forman, founding Director of the Center on Global Justice at the University of California, San Diego, makes recommendations about how governments might actively encourage and support human-rights education -- something few countries currently do. After all, as Roosevelt pointed out, documents expressing ideals “carry no weight unless the people know them, unless the people understand them, unless the people demand that they be lived.” That simple truth must underpin the world’s agenda for championing human rights now and in the future. 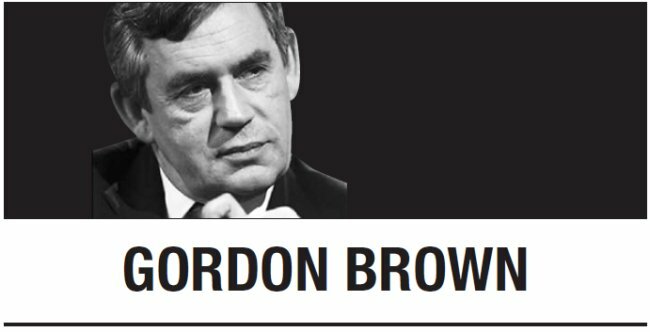 Gordon Brown, former prime minister and chancellor of the exchequer of the United Kingdom, is the United Nations special envoy for global education and chair of the International Commission on Financing Global Education Opportunity. He chairs the advisory board of the Catalyst Foundation. -- Ed.